Although there have been ongoing rumors of Yang Mi (楊冪) and Hawick Lau‘s (劉愷威) marriage falling apart, the couple tried to prove otherwise with their actions. When Yang Mi turned 30 years old on September 12, Hawick made sure to celebrate his wife’s birthday in the sweetest manner. Since Hawick and Yang Mi are busily filming in Mainland China most of the year, they left their two-year-old daughter under the care of Hawick’s parents in Hong Kong. Lau Dan (劉丹)Ya and his wife have been personally taking their granddaughter to school and activity classes. 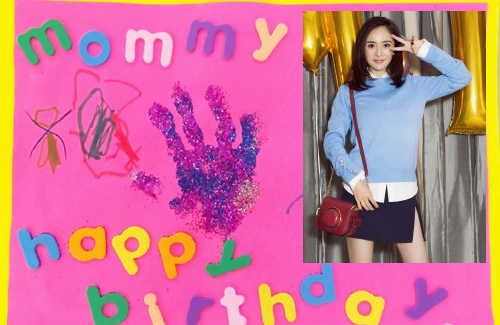 Although Yang Mi had to work in New York on her 30th birthday, Hawick showered her with love. At midnight, Hawick uploaded a card their daughter made along with a warm birthday message. He wrote, “This year, a little princess prepared a very special handmade present. No one can beat her to be the first one to wish her mommy a happy birthday! That is so sweet. I hope they will stay strong together and have more time with their daugther. Please stay strong and not let media destroy relationship ^^ fighting!